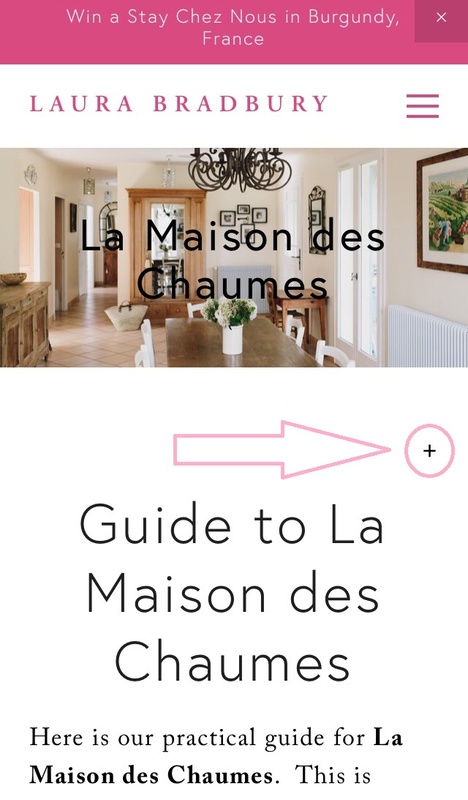 Here is our practical guide for La Maison des Chaumes. This is where you'll find all the information from how to use the phone to how to reset a breaker. Important Points / Please reads!!! La Maison des Chaumes has a strict NO SMOKING and NO PETS policy as per the booking agreement you have signed. The circuit breaker and electrical panel to the house is in the basement in the far right hand corner (to the right of the basement door). Please go down and familiarize yourself with where this is so that you know where to go in the event of a power outage. There is a wind-up flashlight in the right hand drawer of the living room buffet. The room off the laundry room in the basement is where we store sheets and towels for all four of our vacation rentals here in Burgundy. For this reason the cleaners (who we all know very well and trust) may occasionally let themselves in the basement to pick up linens. They have their own keys and will let themselves in and out without bothering you, and they will not be accessing the main floor at all. Our gardener comes periodically to mow the lawn and do garden maintenance. He has his own key to let himself in and out. Garbage pick-up is Thursday morning. Please leave garbage bags in large green lidded bin and leave in front of driveway. If you leave gate open, please ensure that it is secured open with magnetic clips embedded in driveway. If it is windy, close the gate as the wind can cause it to bang shut and could damage the metal. The handle of the front door needs to be yanked firmly upwards and downwards to lock / unlock front door. The kitchen window can be opened in its entirety or just tilted open at the top. To do this turn metal handle to the left and pull window open. The property limitations of this house are as follows – the front yard is ours, the deck is ours, and the backyard is ours to the base of the cherry trees (about 4 metres). The rest of the back garden belongs to our neighbor, as does the strip of grass between the wall of our deck and the old stone wall. The barbeque and garden furniture can be found in the basement. Please BBQ in the gravel part of the driveway only and not on the deck itself. Be careful not to put the barbeque back into basement unless it is completely cold to prevent fire hazard. The house is equipped with wireless high speed internet – just follow the set-up instructions in this binder and contact us if you have any problem at all. You will find games, coloring books for children, etc. in the cupboard in the corner of the living room. Please enjoy! You will also find books stashed here, there, and everywhere for your reading pleasure. The internet and phone connection are provided by the LIVEBOX modem router, the black box located on the side table located in the living room - close to the kitchen. If needed, you can also use the ethernet cable attached to the router to connect your compatible devices to the internet. Please don't use the reset switch as this would reset the router to the factory default for the WIFI network name and password. The default password is 24 character long! No charges for receiving calls. Calls to North American landlines and cell phones are free. Call to landlines in France, Germany, England, Australia, New Zealand are free. BUT cell phone calls to those countries, calls to other international countries and some local special numbers are not free - these phone charges will be deducted from your security deposit. If you don't have a dialing tone, follow the restart the router instructions on the Internet & Wifi page. On garbage days, you can leave the garbage container on the curb just in front of the house.